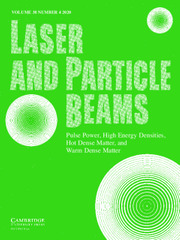 Laser and Particle Beams is an international journal which deals with basic physics issues of intense laser and particle beams, and the interaction of these beams with matter. Research on pulse power technology associated with beam generation is also of strong interest. Subjects covered include the physics of high energy densities; non-LTE phenomena; hot dense matter and related atomic, plasma and hydrodynamic physics and astrophysics; intense sources of coherent radiation; high current particle accelerators; beam-wave interaction; and pulsed power technology.